This Acoustic Audio by Goldwood speaker is designed for use in both professional audio and home audio entertainment applications. It is the perfect complement to any PA system, studio monitor, home theater system or other audio application requiring powerful and professional grade sound quality. 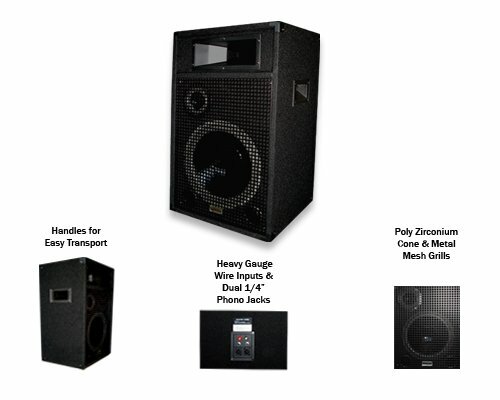 It will handle 1000 watts of power (500 watts RMS), and features a bass reflex design, a 12" poly zirconium woofer with a 4" parabolic RFL voice coil, a 4" poly zirconium midrange and a 10" x 4" optimized compression horn driver. It is constructed with durable heavy duty carpeting, protective corners, metal mesh grills and handles for easy transport. You have the option to hook it up with regular heavy gauge speaker wire, or through dual standard 1/4" jacks. It also comes with a built-in pole socket for a speaker stand. If you have any questions about this product by Acoustic Audio, contact us by completing and submitting the form below. If you are looking for a specif part number, please include it with your message.